With winter here, we're on the hunt for the best holiday outfits that not only work for the office, but also double up as a perfect holiday party ensemble. Y'know - anything that makes our hectic schedules even more convenient. Because who has time to leave work early, change, get ready AGAIN, and make it to the party on time? With the bulk of holiday parties still ahead of you, we tapped some of our favorite fashion bloggers and business ladies to share boss babe party style looks from Kate Spade. For the busy boss who doesn't have time to pull in multiple pieces, what's chicer than a jumpsuit? Maybe these heels? In black and gold, you can strut from office to party with bells (or in this case, pom poms) on your feet. It's not just presents that are for wrapping this season. In a sparkling wrap dress, that can be paired with flats at the office and heels for the party, you've got this in the (cutest little black) bag. Black and white was made for busy bosses. When you don't have time to pattern match, you can get dressed for the day and night faster than you close those deals. Oh, and if it's a rooftop party, you'll be stylish and cozy in a gorgeous tweed coat. Power babes in power outfits, with a few key accessories. In a high-waist pant and crisp white button-down, heading from your desk to festive drinks has never looked so good. There may be songs about ladies in red, but this winter opt for soft colors like lilac because pretty pastel hues aren't just for spring. Go romantic and sophisticated. Casual meets classic with a high waist denim and white button-down. Sometimes when everything is up in the air, you want something simple and sweet. 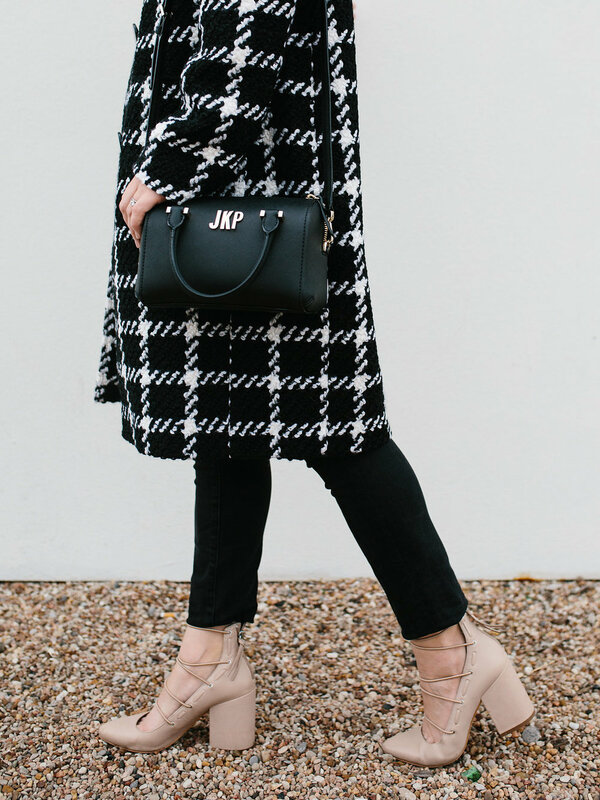 And a monogrammed bag is the perfect addition to this classic look. C&C Classifieds Nº20: Be Social, Fringe Studio, Trendera, & more!